This article will explore the key benefits for creating and displaying digital signage using PowerPoint. With the introduction of PowerPlayer it is now practical for small business and non-technical users to deploy digital signage using PowerPoint in a cost-effective manner. Digital signage has become an essential sales and marketing tool for business. Most big companies have embraced digital signage to promote their products, services and promotions to customers. However, the take-up rate for small business has lagged, causing them to miss out on the important benefits of using digital signage. This article will present 10 reasons for using PowerPoint digital signage. We will focus primarily on the benefits for small-to-mid-size businesses. 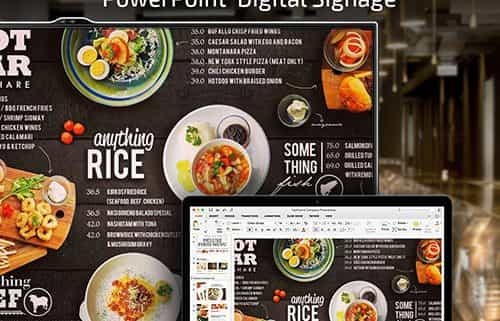 PowerPoint is a great tool for non-technical users looking for a easy-to-use tool for creating digital signage presentations. We will outline 5 basic steps that make a PowerPoint presentation suitable for use as digital signage.